The WEA serves its membership – Evangelical Alliances and other member categories – by equipping them to be effective national associations with transformational impact in and beyond their own nations. We equip our Alliances through communications, research, leadership development, and distribution and sharing of resources. This course will introduce you to the core leadership essentials and foundational building blocks of the association and alliance ministry model. You’ll discover why the leadership competencies and organizational structures of alliances and associations are dramatically different from other models. Topics include foundational principles, understanding your Membership and how to attain strong membership renewal, promotion and marketing, Board Governance, and how to cast a vision in a member driven organization. 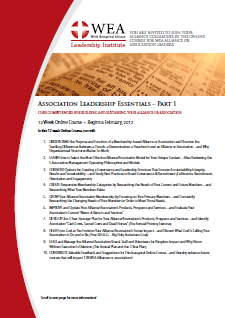 Click here to download the Association Leadership Essentials - Part 1 flyer. The purpose of this course is to provide a theological construct of unity and how that powerfully shapes our ability to influence the world for Kingdom transformation. Students will gain a greater appreciation for the importance of partnership to the success of evangelical alliances. The steps for initiating partnerships and leading them to productive outcomes will be reviewed and applied to context specific situations. This course will also provide a particular focus on positioning alliances to serve as platforms for partnerships. 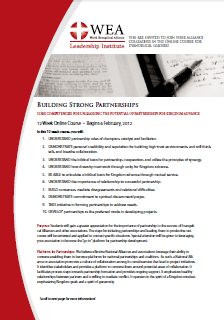 Click here to download the Building Strong Partnerships flyer. WEA-LI courses (subjects) are now hosted by Olivet University with students being able to receive credit for WEA-LI courses through Olivet University. Subscribe to the newsletter WEA-LI Imagine!